I don’t’ know where to begin with this Master Z: the Ip Man Legacy review. See for me I just think the whole thing was just so damn cold, and no that doesn’t mean bad in any way. 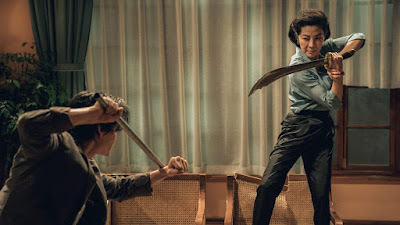 The movie was just so cool and maybe it’s because I’ve been watching so many American movies of late that it was so refreshing to see a very well done and entertaining Hong Kong martial arts picture again. Directed by the master Yuen Woo Ping (Crouching Tiger, Hidden Dragon 2), Master Z is a direct followup spin-off of Ip Man 3. The Ip Man movies are about the hong kong Wing Chun master of Bruce Lee named Yip Man played by Donnie Yen. This film starts with the Ip’s rival from 3 – Cheung Tin Chi who after losing to Ip has given up on Wing Chun and moved away with his son, forsaking fighting and trying to live a quiet life as a store owner. After helping a woman Julia and her friend Nana who owes a debt to a local gangster Cheung are then pulled into the underbelly of the city he’s in as he’s driven back into fighting for his survival and the safety of his son and new found friends. The bulk of this movie is fighting, which is confusing for a story about the main character who doesn’t want to fight, yet always ends up in one. Woo Peng knows what he’s doing and is all about making this a draw for fans of this type of film. Every piece of action is clear and able to be seen. Each and every movie and actor is shown on screen so that us the viewers can understand what’s going on and see the martial arts on display unlike what action directors like to do here in the west. The story really isn’t going to grab that many who are going into this for a deep tale, it’s a decent one and performed well. Michelle Yeoh does bring a lot of depth to her character with her performance. A lot the actors are really there playing what feels like archetypes in the hong kong martial arts drama and that’s perfectly fine. Dave Bautista does well as the sole “American” character, and you can feel a shift in the way these movies portray the big-bad. For a long time, it was always the Japanese who were villains and it made sense going by the very bad history between those two countries, and in more recent times it was the English because of the nature of Hong Kong. In this, though, the bad guy is portrayed as the calculated, big and strong American businessman and it’s not even trying hard to be subtle. 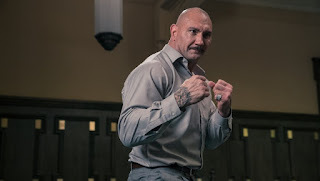 Bautista seems to enjoy playing this role using all his skills from WWE to show both natures of the character as a nice man to an evil killer at the perfect moment. Master Z is such a fun movie, it’s something that can be enjoyed watching at home or if you get the chance to go and see it on the big screen would be even more enjoyable. Great action with amazing fights will put you in a mood to go and watch hours and hours of Kung fu movies and is a great bridge for franchising Ip Man into a global franchise.